Black stretch beanie, guys or girls. Rock-n-Roll GangStar logo embroidered. Wear front, side, or back. Black stretch beanie, guys or girls. Rock-n-Roll GangStar logo embroidered. Wear front, side, or back. 100% cotton. One size fits all. Black stretch beanie, guys or girls. Rock-n-Roll GangStar lettering embroidered. Wear front, side, or back. 100% cotton. One size fits all. **** OUT OF STOCK**** Black stretch beanie, guys or girls. Rock-n-Roll GangStar "Wear It Loud & Proud!" tm logo embroidered in red thread on black beanie. Wear front, side, or back. 100% cotton. One size fits all. ****OUT OF STOCK**** Black stretch beanie, guys or girls. Rock-n-Roll GangStar "Wear It Loud & Proud!" tm logo embroidered in silver thread on black beanie. Wear front, side, or back. 100% cotton. One size fits all. ****OUT OF STOCK**** Black stretch beanie, guys or girls. Large Rock-n-Roll GangStar logo embroidered in red thread on black beanie. Wear front, side, or back. 100% cotton. One size fits all. ****OUT OF STOCK**** Rock-n-Roll GangStar "Rebel Emblem" design premium motorcycle Doo-Rag with our killer artwork. Features an aerated nylon liner and a cotton terrycloth sweatband. 100% cotton with 8-inch ties that allow you to customize to your size. NEW! Black stretch beanie, boys or girls. Rock-n-Roll GangStar Red, White, & Blue Iron Cross 3" logo embroidered on black stretch beanie. Wear front, side, or back. 100% cotton. One size fits all. Very limited quantities available....hurry! 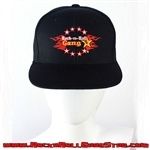 Premium black snap back adjustable ball cap with Rock-n-Roll GangStar color logo embroidered on front.